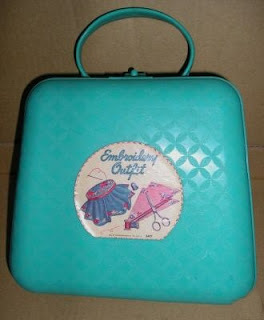 My sister and I each got a sewing kit similar to this one one year for Christmas. 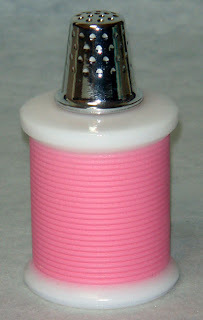 It was a blue plastic case and inside there was embroidery thread, patterns and needles. Probably more too but I don't remember what. I did a lot of embroidery as a teenager and I guess this was what started me on it (as well as watching Mom do it). 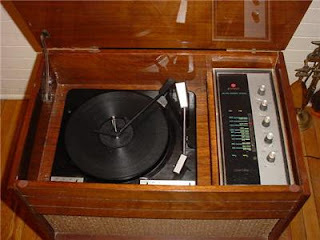 We had an old record player a lot like this one. It was an RCA, I remember the classic picture of a dog sitting next to a gramophone on the inside cover. 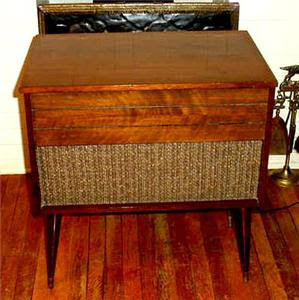 My parents kept it in the living room as a piece of furniture even though we did not listen to records or the radio very often.....usually only at Christmas. It's featured in a lot of photos, it was one of the best places to get a birthday photo done. 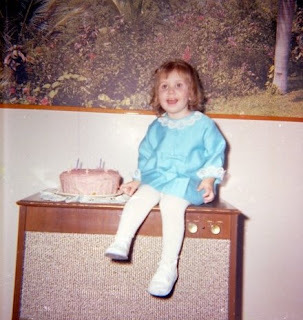 That's me on my 2nd birthday. 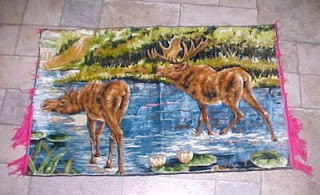 We had a moose rug like this one on our living room wall. It was there for years until we got another one, of a bear (I blogged about it here already). 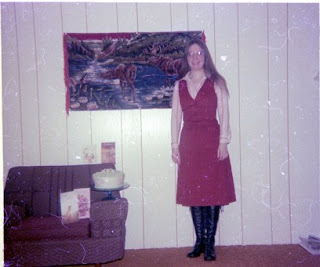 That's my older sister in the photo, it was obviously her birthday, and what better place to take a birthday portrait than in front of the moose rug? 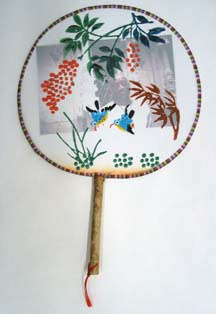 My sister and I had fans like this one, I think we had them on our bedroom wall for decoration. The design was a bit different but the style was the same - bamboo handle with very thin opaque material that had a painting on it. 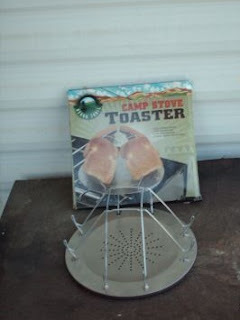 We had dishes, pots and pans that we only used in the camper. 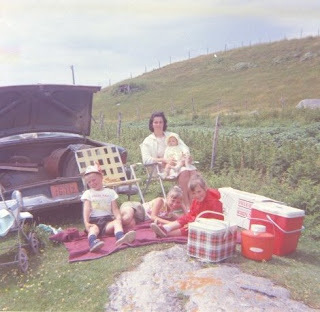 This "toaster" was one of them. I don't remember it working very well, you put the bread on it and then placed it on the camp fire or, in our case, propane burner. It never toasted very evenly. 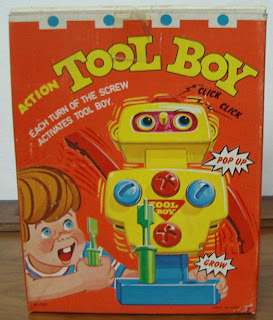 My younger brother had this and even though I was 3 years older than him I loved to play with it too. There were 2 screwdrivers that went in a holder at the front. 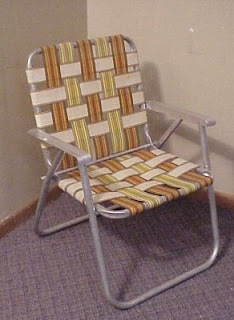 You used these to raise and lower the arms, the legs, the body and the head. The eyes spun around and after he popped up you could push him down and start all over again. 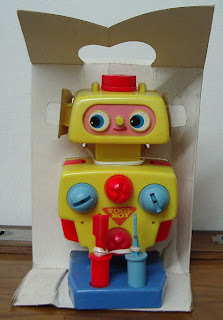 It was a fun toy. 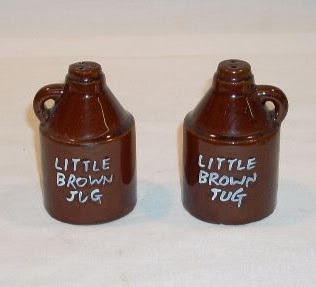 Mom had this salt and pepper set in her collection. It must have been popular because there are several for sale on eBay. You can still buy this game today but it's not the same. 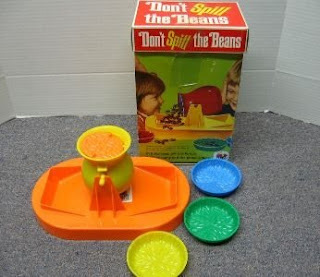 My friend up the street had this game when I was growing up and I remember playing it with her. 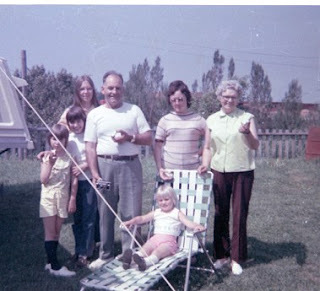 The beans back then were real dried kidney beans, I distinctly remember eating one of them, just to see what it tasted like. 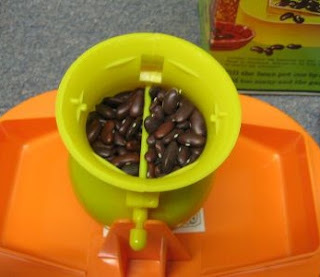 The beans now are plastic. The original game is for sale on eBay. 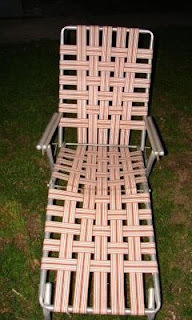 These were the kind of lawn chairs we had growing up. We had 2 like the first 2, with yellow webbing. The frame was aluminum. 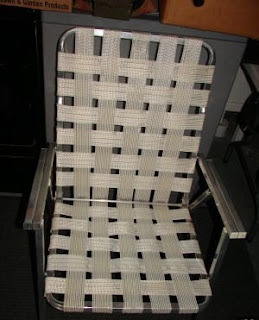 My aunt next door had the lounge chair. I always wished we had one as well. 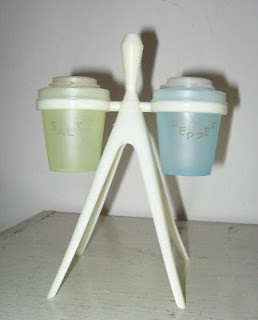 This was another salt & pepper set Mom had in her collection. 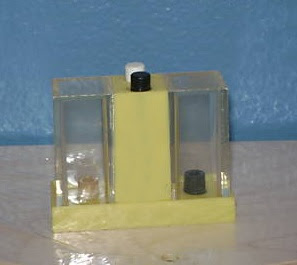 Just push the buttons on top to dispense. 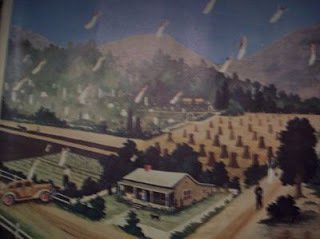 My parents had this print framed on their bedroom wall. I won't go into all the religious aspects of it. On some mornings my younger brother, sister and I would jump into Mom and Dad's bed after they got up and we'd play "Eye Spy". 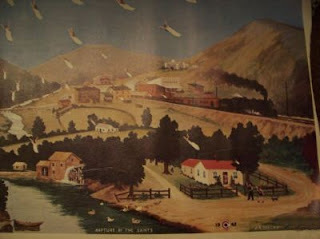 Finding an obscure item in this print was usually what we did. 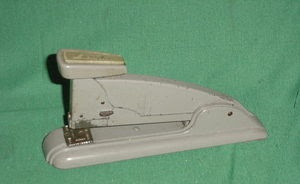 We had a stapler like this one, Dad kept it in the top drawer of the filing cabinet along with other office-like stuff. It was heavy and sturdy and could staple a lot of pages. Different from the staplers sold today, I think. I am not sure what this is called. 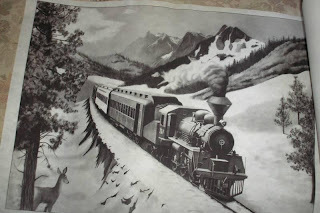 My aunt had this on her living room wall over her piano. 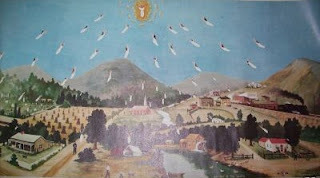 Her daughter painted it for her, rather than use brushes you used tubes of paint. This was for sale on eBay unpainted. Ah, the catalogue! 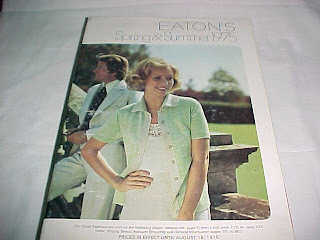 We used to get Eaton's and Sears, both were well read in our house. 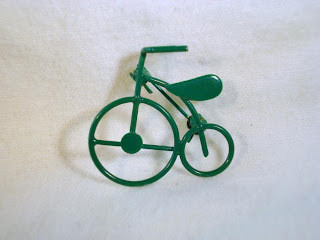 One of my sisters had 2 bike pins similar to this one. I think she had a white one but I am not sure of the other colour. I'd borrow it sometimes to wear on my dress or blouse. My aunt had this cute bottle of perfume on her dresser. 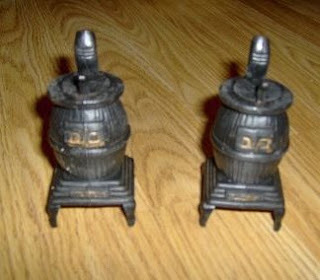 Either Mom or my aunt had a set of salt & pepper shakers like this in their collection.